Sridevi – An actress who tasted all flavours of success in her long journey in Indian cinema in different languages..! This article is a study of the beautiful melodies that Janaki amma sang for this extraordinary talent!! Sridevi played (is playing) a grand Innings as lead actress in Telugu, Tamil, Kannada, Malayalam and Hindi. Janaki amma sang for her in all 5 languages and they gave us many hits to cherish! As a child artist, Sridevi started her career in ‘Maa Nanna Nirdoshi’ Telugu movie where Janaki amma gave play back to her. Later on , she sang couple of songs for her when she was child artist. But, Best of their combination started when Sridevi became lead actress. Especially, songs in ‘Padinaru vayadinile’ started a series of all time classic melodies from this combination. Telugu version ‘Padaherlla vayasu’ saw equal if not more success. Sridevi was established as top most heroine in both languages with these movies. Tamil cinema saw best of this combination. 3 songs from ‘Kavi Kuyil’ – 3 gems with early tunes of Raja sir. Many of the Kamal-Sridevi duets like ‘Perai Sollava’ from ‘Guru’, ‘Radha Radha Nee Enge’ from ‘Meendum Kokila’ were sung by Balu-Janaki and almost all of them are just awesome! and top of all – ‘Chippi Irukkudu’, a classic which is just perfect from Balu-Janaki-Kannadasan-MSV off screen and Kamal-Sridevi on screen won accolades from many! Not only Kamal-Sridevi, but Rajni-Sridevi movies also had absolute gems from SJ where she was paired with KJ Yesudas, SPB, Malaysia Vasudevan to give hits like ‘Hey Padal Ondru(Priya)’, ‘Aagaya Gangai(Dharma Yuddham)’, Sandhana Katre(Thanikattu Raja) ‘ etc .. The starting bit of ‘Aagaya Gangai’ where Janaki amma gave her breath taking Alaap and Sridevi providing a perfect sync for the same on screen is classic example of their coordination. 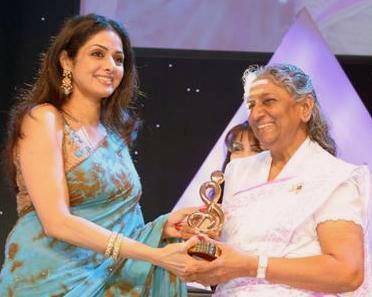 Then came solos like ‘Angatha Nattil (Neela Malargal)’, ‘Vethala Kiliye (Dheiyva Thirumanangal)’, ‘Enthan Kannil (Guru)’, ‘Naan Vanangugiren’.. but one solo that simply stood test of times and received infinite acoolades for both Sridevi and S Janaki is ‘Katril Endan Geetham’ from ‘Johny’. Raja sir’s magical composition with Janaki amma’s outstanding performance gained more beauty because of Sridevi madam’s magical performance on screen..! Next to Tamil cinema, Maximum hits from this combination is in Telugu (may be more than Tamil also in terms of numbers). 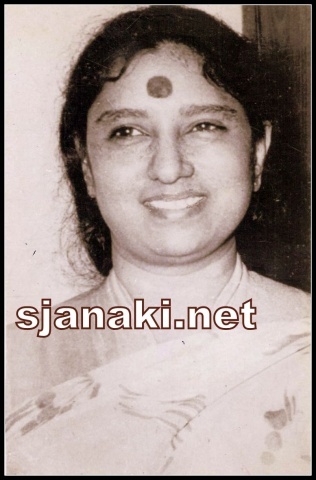 ‘Sirimalle Puvva’ is standard song for Janaki amma in all her concerts from 1978!! Another song which is very close to Janaki amma is ‘Nee Kowgililo Thala Daachi’ from ‘Kartika Deepam’. Janaki amma could not cancel a recording of this song even when her husband was admitted in hospital for a heart attack.She went to recording theatre with a very heavy heart and just poured her heart and soul into lyrics of this song! Sridevi madam did 100% justice to her singing not only in this song but all other songs that Janaki amma sang for her in the movie.This movie had a wonderful alaap by SJ whenever Sridevi appears on screen in this movie.. What an alaap it is!! Then came songs from movies like ‘Bangaru Kanuka’, ‘Gaja Donga’ etc.. But, Best of Sridevi-S Janaki in Telugu came in form of ‘Jagadeka Veerudu- Athiloka Sundari’, where Janaki amma (along with Balu sir) sang dreamy ‘Andalalo Aho Mahodayam’, divinely romantic ‘Priyathama’ and captivating ‘Yamaho Nee Yama Yama andam’. When you see Sridevi dancing for Sj’s vocals in yamaho nee ‘Nallani katuka petti, gajjelu katti’ – It is perfect blend of a expression from voice and face!! The grace they added to this song is beyond imagination!! ‘Priya’ was a bilingual movie in Tamil and Kannada. In Tamil, Janaki amma sang only one song ‘Hey Padal Ondru’ with KJy sir, but kannada movie had all songs by Sj only .. A solo ‘Darling Darling’, two duets with KJY sir .. All were chart busters..! Among the Malayalam songs that came from this combination, Two solos simply stand out…! Salil da’s ‘Swapnadanam (Thulavarsham)’ and AT Ummer’s ‘Neela Jalasayathil (Angeekaaram)’ had a young Sridevi delivering an emotional performance on screen with SJ’s memorable performance off screen. One duet – ‘Yamune Nee Ozhuku (Thulavarsham)’ with KJY-Sj singing Salilda’s tune is simply one of best from this duo… Janaki amma’s gamaka’s at end of charanam are must hear!! In Hindi, ‘Gori Ke Sajan, Sajan Ki Gori’ is most popular with other hits including ‘Jab Ladki Seethi bajaye’ etc .. ‘Ghayal Ghayal’ from ‘guru’ is an interesting song where Janaki amma got to sing in a very bright manner for energetic Sridevi and in an exhausted way for wounded Sridevi.. Included bilingual versions of ‘Akalai Rajyam’, ‘Guru’ etc but did not include Dubbing songs here. However ‘Yadalo Tholi valape(Erra Gulabhilu)’, ‘Ragile Ee Naa Geetham’ (Naa Pere Johny) and Edo Raagam (Kalyana Ramudu), ‘Nee Navvula lona (Dharma Yuddam), ‘Nee pedavula lona (Ajeyudu)’, ‘Ee Erra Gulabhi (Erra Gulabhilu)’, ‘Manakosam (Vasantha Kokila) are very good melodies in Telugu Dub versions also. Similarly, ‘Jagadeka Veerudu Athiloka Sundari’ and ‘Oka Radha Iddaru krishnulu’ were equally good in Tamil dubbed versions ‘Kadhal Devathai’ and ‘Hare Radha Hare Krsihna’. Interestingly, ‘Katril Endan Geetham”s Hindi dubbed version was also sung by Janaki amma – ‘Chedi Maine Sargam’. 1979	 Tamil	 Arumbugal	 Cheri Kuzhanthaigal.